Katie and I survive our first night camping in freezing weather with our new Wilderness hot tent/wall tent! In terms of the BEST tent in the world, there can be only one and in my opinioin it is the WALL TENT! See why wall tents are the top tents around. Our wall tent from WallTentShop.com arrives and we prepare the poles, we cure the wood stove and we set off on our first winter camping adventure and its going to be cold. We do some winter camp cooking on our wood stove. This video features 6 parts, but we think you will enjoy the entire episode. The purpose and definition of a tent is “shelter”. 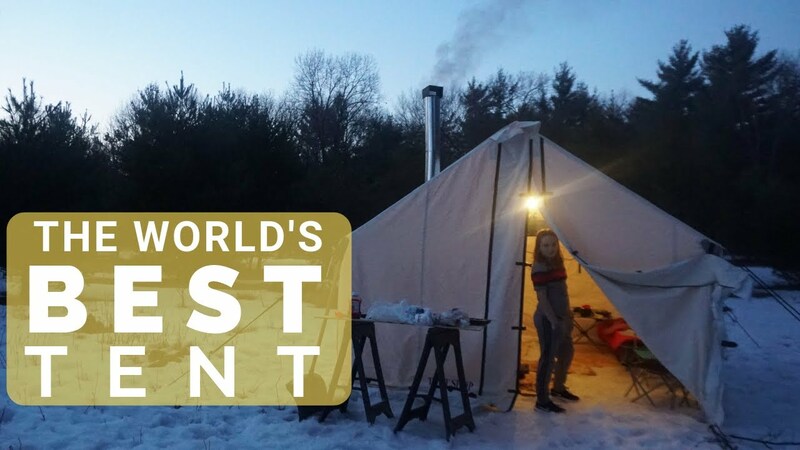 A wall tent not only provides great shelter, it also provides warmth and a place to cook with a wood stove. It’s like a portable tiny house that can be setup anywhere and used in the coldest of climates. It’s also the best tent because unlike traditional tents you don’t have to hunch over and crawl around on the ground. When your inside a wall tent it’s like being inside a small cabin. You can stand up straight. You have an area to sleep, sit and cook. Wall Tents are the BEST! Come along with us on our wall tent adventure! *We were not paid to promote this product. We were given the product and we provided an honest assessment and review. It takes us hours per week to document our journey on both our blog and our YouTube channel. Some videos take hours to produce, edit and publish! If you enjoy watching our videos and want to help us to produce more of them, learn how you can help us without spending a dime!